CANDLEPOWER: A term used for the luminous intensity of a light source. The intensity in any one direction from the standard candle is one candela (formerly one candlepower; cp). COLOR RENDERING INDEX (CRI): A measurement of the color shift an object undergoes when illuminated by the light source, as compared to a reference source at the same color temperature. Color rendering is measured on an index from 0 – 100, with natural daylight and incandescent lighting both equal to 100. Object people viewed under lamps with a high color rendering index (CRI) appear more true to life. COLOR CORRECTED LENS: A compound lens, the dimensions and materials of which have been so chosen that the lens is appreciably free of aberrations. COLOR TEMPERATURE: The chromaticity of an ideal “black body” when it is heated to a specific temperature in Kelvin (K). It is the measure of the color of light, not actual temperature. COPY BOARD: Area of a projector where original photo or artwork is placed or positioned. DIRECT PROJECTORS: Projectors, which project an image directly onto the work or drawing surface (i.e. drawing table or wall). 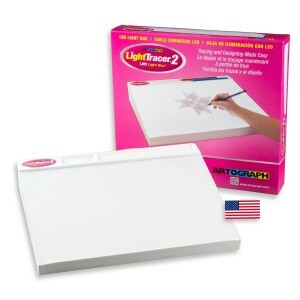 The image can then be traced or re-drawn with a variety of mediums. EFFECTIVE COPY AREA: The area of the copy board that is seen by the lens. This area becomes the projected image. FOOTCANDLE: A unit used in measuring direct illumination. It is defined as the illumination produced from a source of one candela at a point on a surface of one foot away and perpendicular to the source of light. A lumen per square foot. FRONT SURFACE MIRROR: Featured in all Artograph projectors. A highly reflective mirror that has the silver coating on the front surface of the glass. Ideal for use in projectors. ILLUMINATION: The result of the use of light, illuminance, the density of luminous flux on a surface, is usually measured in footcandles. INCANDESCENT LAMP: The typical type of lamp found in the home. Usually has a lamp life of 750 hours. Soft white or photo type work best for projector use. INDIRECT PROJECTORS: Projectors, which projects an image up through a sheet of glass onto tracing paper. Once traced onto tracing paper the image is either transferred to a final drawing surface or used as is. KEYSTONING: The type of distortion created when the projector is not positioned perpendicular to the receiving plane (table or wall). Identified by having one side of the projected image larger than the opposite side (trapezoidal). Always measure all sides of your image to insure accuracy. LIGHT: The term generally applied to the visible energy from a source. Light is usually measured in lumens or candlepower. When light strikes a surface it is either absorbed, reflected or transmitted. Light is said to travel in straight lines. LED (LIGHT EMITTING DIODE): This term refers to a type of light source that uses less energy than most other light sources, and produces less heat. They generally have longer lifespans and lower power consumption than other lights of equal brightness. LUCIGRAPH (LUCI): A popular name for an indirect-type of projector. Often used to identify all types of artist projectors. LUMEN: The unit that expresses the total quantity of light given off by a source, regardless of direction. A lumen is defined as the amount of light falling on a surface one square foot, every point of which is one foot away from a source of one candlepower. A uniform source of one candlepower placed in a sphere emits 12.57 lumens or mean spherical candela equals 12.57 lumens. LUMINANCE OR BRIGHTNESS: The light emitted, transmitted or reflected from a unit area of the source of surface is brightness. It is usually expressed in candles per square inch or Lamberts or foot Lamberts. OPAQUE PROJECTORS: A general classification of projectors, which project images from any solid or opaque copy such as photos or drawings. Opaque projectors require a darkened or totally dark room for best results. RATED AVERAGE LIFE: The operating life (hours) at which 50% of the lamps are still operating. Where a plus (+) is used in starting the life, survival rate is 67% at the standard time. SAFTEY OVERLOAD CIRCUIT: A circuit designed to shut off the projector when the projector has reached a set temperature. The projector will automatically turn back on once it has cooled down and reached a safe temperature for operation. SECOND SURFACE MIRROR: The type of mirror generally found in the home. The silver coating is on the backside of the glass. Not suitable for projector use, will cause a double image or a “ghosting” effect. TOP LOADING: This is a feature of a projector, which means that the original artwork or photo is placed on the top of the projector. The top-loading area is usually a glass surface. Top-loading units allow for easier position of originals and accommodate oversized originals as well. TRANSPARENCY PROJECTOR: Includes all models of projectors, which project transparencies only. Generally will not project slides without accessory attachments. Excellent for use in normal room light and where large images are desired. TUNGSTEN HALOGEN LAMP: A type of lamp, which contains the elements halogen gas and tungsten sealed in high-pressure envelope. Produces a high intensity light throughout its life.